Get Toni Turner as your Personal Market Guide! Imagine how much easier your trading could be than it is now. If you could save hours of hand-wringing… get rid of that confusion about what to trade and when… see the markets through the eyes of a seasoned professional trader… and have a weekly game plan to give you clear direction for your trades. Here’s the good news. It doesn’t have to be difficult to achieve the results you truly desire. Let me show you how I’m helping scores of traders just like you every week. I’m showing them an easier path to lasting success – and that ultimate lifestyle that it can bring you. 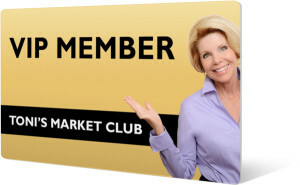 When you join us in Toni’s Market Club, I’ll act as your personal market guide. I’ll share the insights and experience I’ve gained during my 18 years as an investor, trader and educator, and apply them to today’s market for you! This could very well be the most productive use of your time as a trader. That’s because when you follow my easy-to-understand weekly trading plans… you will have more time to enjoy with your family doing the things you really want to do. In just 90 minutes, you’ll have a clear idea of what you need to trade successfully for the week. I would like you to join me each Monday afternoon to plan out your trading strategy for the week. You’ll love the world-class training environment to help you absorb all of the insights and strategies I’ll give you every time we meet. With this added insight and pep-talk, you’ll be ready to get the most out of that week’s trading sessions! Each week I will give you my overview of the major indices using live, up-to-the minute charts. Plus, I’ll also show you how I am analyzing the Dow, S&P 500, Nasdaq 100, and what market action you might see in the days ahead. You’ll learn which sectors and industry groups look poised for potential runs to the upside, which ones look ready to plunge lower, and how you can get in on the action. Using live charts, I will share my years of experience to help you analyze charts and markets safely and successfully. You’ll discover tips and techniques that will help you improve your trading and investing skills – instantly! In addition to all the market insights, I will also teach you a new mini trading lesson each week based on what’s happening right then in the market. You can then take that new insight and apply it to your trades the very next day. Every traders wants to know where they should be looking for new trades… which is why I will pinpoint stocks and ETFs that look ripe for profitable trades. This is your chance to ask me all your questions about the market, your favorite stocks, or trading and investing strategies. I’ll share my expertise and wisdom with you to point you in the right direction. Who Is Toni's Market Club For? If you are a beginning to intermediate trader or active investor, with at least basic chart-reading skills, you will gain the most from these informative weekly meetings. The traders who get the most from Toni’s Market Club are those who are dedicated to trading the right way… for the right reasons… and who appreciate a supportive community of fellow traders to share ideas and insights. On the other hand, if you are looking for an audience to show off, or you want to dominate the conversation, then this may not be the right situation for you. The traders I typically work with are very smart people: engineers, doctors, and other savvy people who know how to think. They are good analytical thinkers and are committed to developing an emotion-free way of trading the markets. But the one complaint I hear from them all the time is that it just takes so long to analyze the markets to find good stocks to trade… and then it can be difficult to trust what you think you’re seeing on the charts. That’s why Toni’s Market Club can be so helpful to any trader who is serious about finding a way to be more consistently successful. I’m dedicated to giving you fast information you can use immediately. You won’t need to study for hours to figure out how you are going to trade. That’s because Toni’s Market Club is a live, 90-minute webinar (plus an interactive Q&A session) held on Monday afternoons. I have been writing best-selling books on trading and investing for a long time. And my students love my live seminars. Now, with Toni’s Market Club, I will show you what it takes to succeed as a trader and/or active investor in today’s stock market! Based on my in-depth analysis, we will discuss up-to-the minute market events, major index trends, and even show you sector winners and losers. You’ll discover new trading strategies — and you’ll find out which stocks and ETFs I’m watching for potential buying or shorting candidates. I let you get inside my head and follow what I know – so you can follow my simple steps that make the market more understandable for the average person. If you’re willing to follow my instructions and put in a little time on your own, you are the right kind of person to benefit from Toni’s Market Club. Why do I give you so much information in such an easy-to-understand way? Because that’s exactly how I wanted someone to do it when I was getting started as a trader, but nothing like this existed. Now, you get to reap all the benefits of my hard work. …to keep you on track based on what happens between each weekly Market Club session! …with occasional appearances by some of the most respected names in the trading industry to help you learn from their own expertise! …to make sure you’re always on top of the latest trends and techniques! No Problem! We’ve carefully designed Toni’s Market Club to be very convenient for your everyday life. We understand that today’s lifestyle requires you to juggle family, work, commutes, and the hectic pace of daily life. That’s why you can attend Toni’s Market Club at the regular Monday session or access that recording shortly after that Market Club has concluded. Of course, you can also do both! Which means that if something comes up… or you are traveling… or you want to review a session… you can simply watch the recorded video so you won’t miss a thing. It’s the next best thing to being there! FREE RECORDING ACCESS: After the session, you will receive access to the recording from your online account at ToniTurner.com. FREE TONI’S MARKET CLUB TRADE CRITERIA: You will get entry, profit target and protective stop criteria for Toni’s three winning set-ups: the Sleeping Tiger, the Hawk, and the Coyote. FREE TONI’S MARKET CLUB UPDATE: After we meet on Mondays, we’ll send you an email update on Thursday… where Toni will give you her current market overview, plus updates on stocks & ETF positions. TMC MEMBER FORUM: You will have access to our exclusive online member forum where you can post trading questions for Toni and connect with other members. DISCOUNTED PRODUCT PURCHASES: Once you attend your first session, you will automatically receive $20 off any of Toni’s Recorded Online Seminars. MONTHLY PRODUCT DRAWING: The first Monday of every month, we draw one name of a Market Club member to receive a free Toni Turner product of his/her choice. I’m writing to thank you, Toni, for everything you do for us stock traders. Your three moving average entry and exits have been a godsend to me. I do not get emotional anymore when I follow the entry and exit rules that you have us follow. I appreciate very much your [Toni] willingness to teach us how to become successful traders rather than make us completely dependent upon you. So, thank you for your willingness to teach me your craft. And, you do it in such a kind and respectful way. I wanted to thank you for what you have done for me Toni. I think I’ve been with TMC [Toni’s Market Club] for 5 or 6 weeks now and have already made enough money to start having to pay the IRS quarterly and to have paid for TMC many times over. Your recommendation of Floor and Décor (FND) returned over a 10% gain in just a few days. I have profited on many of your suggestions and I haven’t had any significant stops to speak of. Just a note to say thank you for The Club. I appreciate all that you [Toni] provide. Classes are truly great, twitter gives very important updates to help me stay focused on the big picture (I tend to get caught in details) and the Thursday updates are very important for a complete circle on what was taught. I’ve been trading part time for 4 years and feel like such a beginner. I’ve been a member of The Club since January, and am now getting into the swing of using all the club tools. Yesterday’s session was exceptional. I learned so much and was able to assess the charts for myself with my software (telechart). So – thank you! Traders everywhere are scrambling for an advantage in the market. Join us inside Toni’s Market Club to give yourself the advantage you are looking for. Each week I will help you become the trader you really want to be by showing you what is happening in the market… how you should position yourself… why it’s important… and what to watch out for. I’ve made it as easy as possible for you to succeed with my experienced guidance. Don’t let this opportunity slip through your fingers. Grab your Discount Membership now for just $117 per month billed automatically to your credit card (regularly $145) while this is fresh in your mind and before you set this aside. As a member of Toni’s Market Club, you’ll be part of an elite group of traders focused on achieving their very best each week. It’s perhaps the best value available to traders anywhere! For less than your weekly lunch tab, you can join us for your weekly trading plan… and more!